Enjoy this unique, hands-on and authentic project to expose students to what it is like to live with a disability. 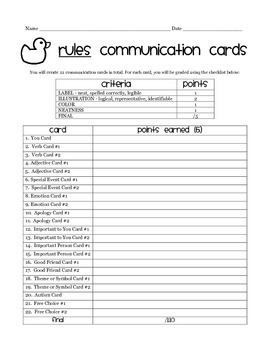 As students read Rules by Cynthia Lorde, they create a communication card book, much like the character, Jason, uses to communicate. I cut cardstock baseball card sized and the students display their cards in trading card sleeves for binders. This project can stand alone, or work with my guided reading packet for the novel (also for sale), which suggests when each card should be created to coincide with the text. Students love the hands-on and artistic component of this project. Enjoy, and please check out the rest of my Rules products!